Kevin Meyers and Paul Patterson, both from Draper, South Dakota Paul purchased several of the top sellers, including Lots 517 and 549. 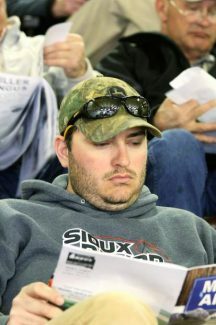 Robbie Calkins, Ft. Pierre, South Dakota, purchase a couple of the top sellers in Lots 535 and 52. 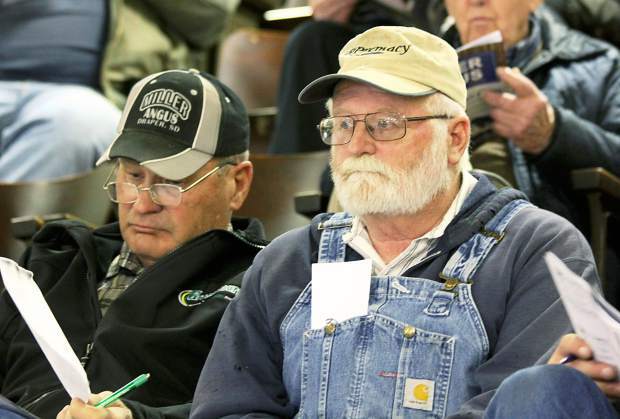 Miller Angus hosted a nice crowd of mostly repeat buyers for their 34th annual sale. This good cattle herd is owned by Curt and Janet Miller, and Casey and Monica Miller and their young family. The Miller bulls are bred to have length of body and growth. 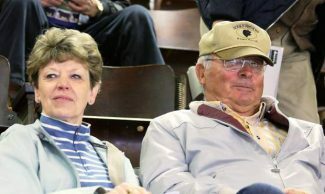 They are also bred and managed for good dispositions—and they proved that coming through the Presho Sale Ring. Their slogan is, "Where genetics come first." They put out a complete catalog with comprehensive data on each of the bulls. Gains and productivity factors are right there for comparison. You will find pathfinder status in the backgrounds of a number of the mothers of these bulls. The bulls were presented in modest flesh to ensure their feet and legs stay sound, but they still showed a lot of growth and style in the ring. The sale moved along at a good pace, with several repeat buyers buying multiple bulls. 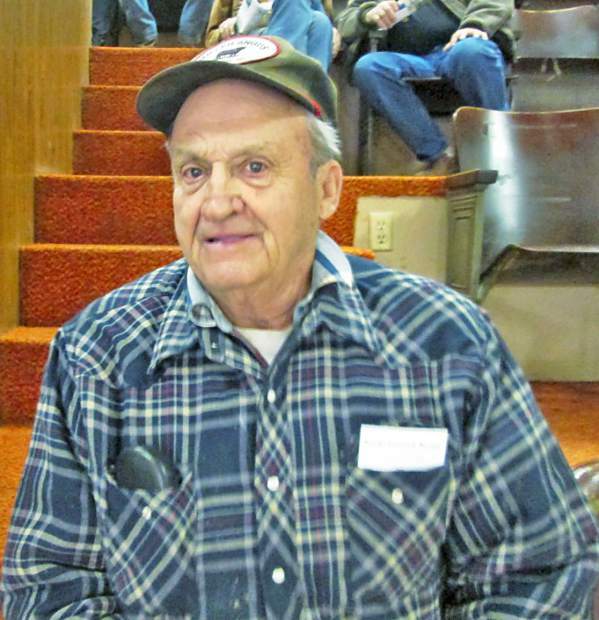 Curt made special recognition of the passing of Donald Bill Volmer. Donald had purchased the first bull that Curt ever sold, and several more over the years. The heaviest bull in the sale was Lot 517, and he sold for $9,500 to longtime repeat buyer, Paul Patterson, from Draper, South Dakota. He was a son of Barstow Cash and out of a TC Broadside dam. He had a 72 pound birth weight, a weaning weight of 765 pounds, and a yearling weight of 1471 pounds. His rib eye measured 14.6 square inches, with a scrotal measurement of 38.5 cm. His EPDs were BW 2.5, WW 75, YW 133, and MILK 23. 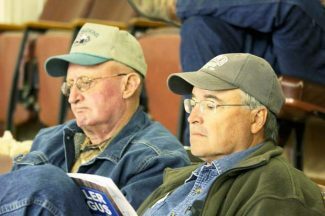 Another bull at $9,500 was Lot 52, also headed to Ft. Pierre, with his purchase by Robbie Calkins. Here was a son of KR Little Joe, and out of a Pathfinder daughter of Hoff First Edition. His EPDs were BW 4.2, WW 63, YW 110, MILK 24, and $B 140.00. With his 90 pound birth weight, he weaned at 682 pounds and reached a yearling weight of 1,388 pounds. Luke Dowling from Draper, South Dakota, liked Lot 518, and paid $8,500 to own him. He was a son of Barstow Cash, and out of a dam by Schurrtop MA Broker. He entered the world at 84 pounds, weaned at 680 pounds, and grew to a yearling weight of 1,386 pounds. His EPDs included BW 3.5, WW 69, YW 127, and MILK 21, along with a 41.5 cm. scrotal measurement. Another selection for Paul Patterson was Lot 549 at $8,500. This son of TC Broadside was out of a Hoff First Edition bred dam who had ratioed 104 on ten calves.